And here's the badger-nose fairing. Did a fair job of keeping the rain off. 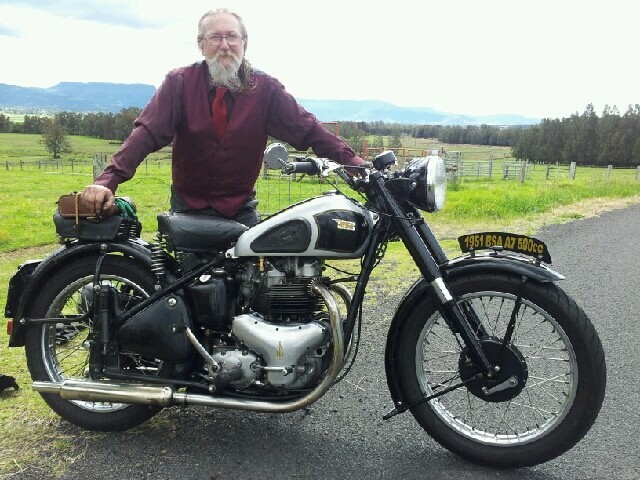 Note the fine display of bike at the VMCC gathering. I fitted a Pantera fairing to a Honda CX500 I had - loved it, absolute luxury. Here's a photo of it, late 80s. My bike had one of those, (Black Sheep) fairings when I bought it. I must have chucked it. Looks pretty good actually. Never had fairings on any of my bikes - just didn't like them. When I was dispatch riding, I did fit a screen through winter, especially as it was down to -12 without the wind chill - did make a huge difference. I did have handlebar muffs too, but they kept pushing the clutch and brake levers in - not good. The answer, put on some motocross plastic protectors then put the muffs over them. These days, I just absorb all the battering, wind, rain, flies (wasps inside the helmet) - bloody 'ard I am! Took my OIF Thunderbolt out on it's first ride since restoration. I have never seen so many old boys stop and smile as I rode past. That put a smile on my face. Would post photos but I can't, but I can email them to anyone that can. Thanks. Compression reads over 200Lb/sq" in 1,3 and 4, only 120 in 2. Already on 2mm over Wiseco's. I can get 2.25mm over but their cast not forged. I should know tomorrow night if I can use them ($1000) or have to sleeve the barrels. Last week put new bearings and stub axle in the Cafe's rear wheel and greased the s/a bushes. Sat in all morning waiting for the postman to come with some new parts but he never came so another day wasted . Hope he comes in the morning. Looks like the mice have been at it. #2 piston and top rings on 1 & 4 broken. G'day Musky. Always nice to find a simple answer. Looks like pre ignition has eaten away the top land. Too much advance, low octane fuel, but I reckon it was a bit of a flyer in your skilled hands. 11:1 compression and 102 octane fuel so it's the timing. Very hard to see the timing marks on these things. New sleeves and pistons won't give me much change out of a couple a grand. Looks like a lean Xmas again. Well. Took A10 out for a race to cafe for coffee. Intention being to use up fuel,remind myself of all the current issues and set my mind to a winter lay up (have a replacement vehicle with 2 wheels). I know it needs lots of love (money) and work so expect some inept and innocent questions in the near future. Also dislike salt and icy roads on a bike that has a rusty frame and little braking. Started out on a 25 mile round trip and ended up getting in 90. Long ride for a coffee, ended up in another country. Who could have predicted that the bike would go so well? Starting easily and even idling at the lights well enough for me to get off and check the oil return. Had a couple of scary surprise junctions which got the heart rate up and right hand and left foot working hard but managed to avoid collision. Serves me right for giving it plenty of gas! Also means that winter lay up will have to wait, i need more of that BSA experience. Putting the bottom end together for a friend; 1955 Shooting Star. Just completed modifying the anti-wet sumping valve to improve the performance. In my opinion the existing spring is too light, and exerts insufficient pressure. This is confirmed by BSA's change to the A65, where they used a much heavier spring for the same role. I replace the existing spring with the A65 spring. I also make a modified retaining screw. The overall length is increased to approx twice the original (0.285"). This is to increase the thread contact in the casing in order to stop oil leaking past. A 3/8"BSW tap has to be used to increase the thread depth (a couple of threads). I use Loctite 569 (hydraulic sealant) on the thread as well. Finally the spring side of the screw is countersunk 0.120" to centrally locate the spring, and ensure that the ball moves completely below the oil supply hole to the bushing, when coil bound. The ball needs to be lightly tapped to re-seat (no more than a tap!). The ball seat pressure is significantly increased, and there is 0.3" movement of the ball away from the seat. 110 miles on the clock on the Super Rocket in quite chilly conditions today, 40 miles from Deal to Joes Café in Tenterden for cholesterol surprise, 40 miles with the Kent section of the BSA Owners' Club to Shipwright Arms in the middle of nowhere near Faversham for a pint and 30 miles home down the back lanes. Excellent ride on a fine chilly autumn day. Go t' pub Berger ol' son. Page created in 1.051 seconds with 20 queries.